Pearl Sydenstricker Buck (nomine Sinico 賽珍珠 Sai Zhenzhu quod dicitur etiam John Sedges; nata Hillsboro in vico Virginia Occidentalis 26 Iunii 1892 ; mortua Danby in vico Mons Viridis 6 Martii 1973) fuit scriptrix Americana. 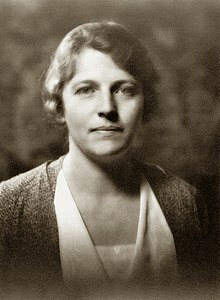 Pearl Buck, circa annum 1932. Imago a Arnoldo Genthe capta. Pearl Buck, evangelii praeconis Absalom Sydenstricker filia, multos annos in Sinis vixit et ergo de hac civitate multa scripsit. 1918 nupsit praeconi Iohanne Lossing et post divortium anno 1934 Ricardo J. Walsh. Anno 1932 operis The Good Earth gratia Praemium Pulitzer et anno 1938 etiam Nobelianum Litteraturae Praemium accepit suae biographiae ratione. Etiam littares pueriles scroipsit et beneficentia pro adoptionibus orphanium et iura mulierium et iura minoritatum defensit. Vicimedia Communia plura habent quae ad Pearl S. Buck spectant. Petrus Conn: Pearl S. Buck. A cultural biography (Cantabrigiae 1996). Theodorus F. Harris (ed. ): Pearl S. Buck. A biography (Londinii 1970/72). Hilara Spurling: Burying the bones. Pearl Buck in China (Londinii 2010). Nora Stirling: Pearl Buck. A woman in conflict (Piscataway Novae Caesareae 1983). Novissima mutatio die 26 Iunii 2017 hora 13:19 facta.